This Sour Cream Noodle Bake is an easy weeknight meal that’ll have everyone running to the dinner table! I’m a self-proclaimed carboholic. Bread, pasta, pastries, cakes, I love them all. I regularly buy a loaf of french bread at the store and graze on it all day. It’s the best! 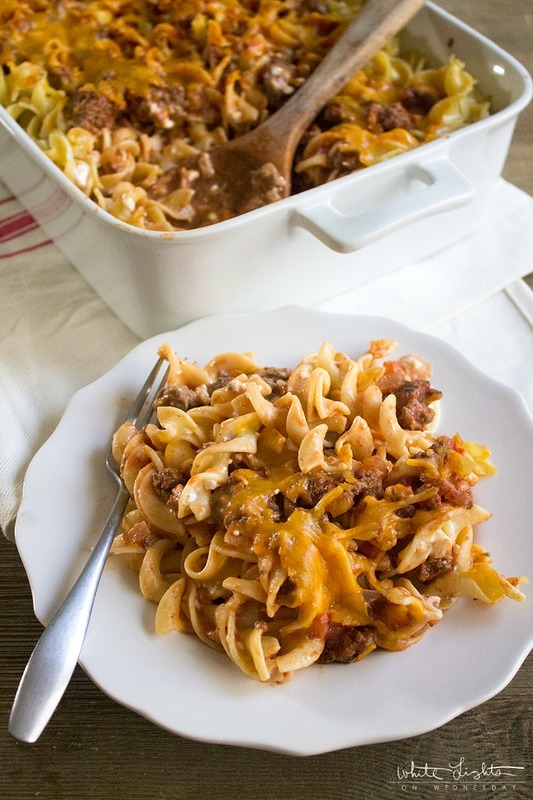 So it’s no surprise that pasta dishes, like this one, make a regular appearance at my house. They’re filling and are a breeze to make. Boil a pot of water, cook the noodles, and so other yummy stuff, and voila! Dinner! I first came across this recipe in a menu plan from another blogger. I had made a few of Kristan’s recipes and loved them, so if she signed off on a recipe I knew if had to be good. 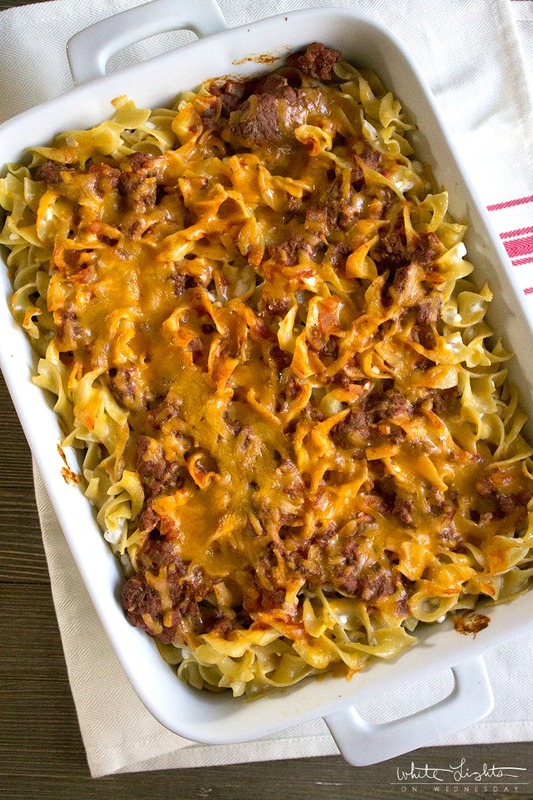 So, years ago, I made this noodle bake and l-o-v-e-d it! It was easy, no crazy flavors (my husbands’s a pick easter sometimes), and the leftovers were good too. Comfort food all the way. A year of two later, I realized this recipe was from The Pioneer Woman. I had started making this dish before her Food Network Show so she wasn’t famous in my house yet. But now I have a couple of Ree’s cookbooks and love trying her dishes too. While this recipe is pretty simple, I did add some flavor boosters of my own. A little onion and garlic in with the ground beef makes a world of difference. Ree likes to mix in some green onion with her sour cream mixture too, but Mike’s not into that so I didn’t use them. They would be a great garnish on top too for some more color. I’ve even been know to throw some French’s onions on top of the cheese during the last 5 minutes of cooking for a little crunch. It’s pretty delicious. 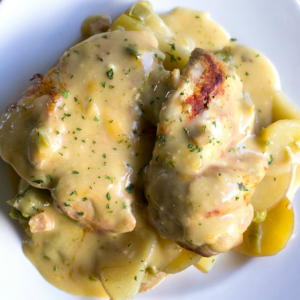 Once your family tries this dish, they will ask for it again and again. 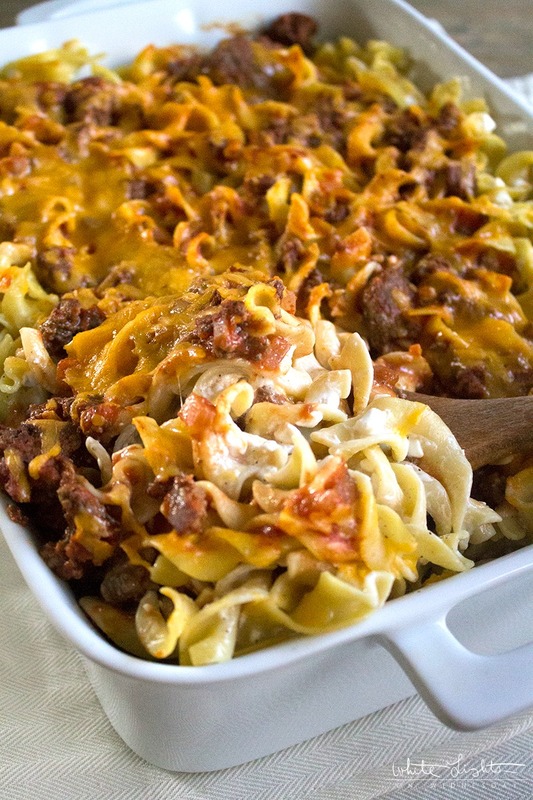 This Sour Cream Noodle Bake is an easy weeknight meal that'll have everyone running to the dinner table! Heat a large skillet over medium-high heat. Add the ground beef and onions and cook until the beef is almost completely browned and the onions have softened about 5 to 8 minutes. Add the garlic and cook for 1 to 2 minutes, stirring often to prevent burning. Add the tomato sauce to the skillet, stir to combine, and simmer while you prepare the rest of the ingredients. Bring a large pot of water to a boil. Add the egg noodles and cook according to package directions until al dente. Drain and set aside. In a medium mixing bowl, stir together the sour cream, cottage cheese, pepper, onion powder until evenly combined. Add the sour cream mixture to the noodles and stir to coat the pasta. To assemble, add half of the noodles to a 9-inch by 13-inch baking dish. Top the pasta with half of the meat sauce, and then sprinkle half of the cheese over the sauce. Repeat the layers once again. Bake for 20 minutes, or until all cheese is melted. Carefully removed the baking dish from your oven. Serve immediately, or let sit for 5 minutes. We like to serve this dish with a green salad and crusty bread. Could I use whole grain macaroni noodles instead of the egg noodles?? You mention in directions about putting green onion in recipe, but I don’t see listed in main ingredients. How much green onion do you use? Sorry about that! The green onions can be used in place of the onion powder. I’ve amended the recipe to reflect both options. Thanks for point that out! I have a ? I don’t like cottage cheese can I subsitute it with ricotta cheese? I hate cottage cheese too but actually love it in this recipe. Could you substitute V8 juice for tomato sauce? Grew up with this. We call it Dairy Casserole. Love it! Do you think the tomato sauce could be replaced with a can of sloppy joe sauce? Could I use Ricotta instead of cottage cheese? My family has been making this casserole for at least 65 years! Crazy to see it here. Personally it isn’t complete without the green onions!! Get the latest recipe inspiration from White Lights on Wednesday...right to your inbox!